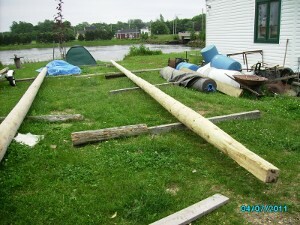 I have finally finished hewing out the basic shape of the main mast with the foremast pole in line. The whole process took about 14 or so hours done over 4 days. The main delay is weather as I wait for a few days of sun / no rain to work on the poles. I’m not due to start again for another 4 days due to a series of showery days ahead. To finish the poles I will need to power plane, belt sand, linseed oil, and fit the masthead crane complete with blocks and rope. The crane has yet to be fabricated. 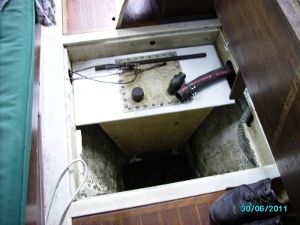 Back on the boat I have fitted the newly built fuel tank and will now need to fabricate partners and step. I have ordered all the canvas, grommets, thread and basting tape from saibrite. It’s due to arrive next week. This entry was posted in junk rig, junk rig design, masts and tagged alberg 37, grown mast, junk masts, masts, red pine. Bookmark the permalink.